Hydropower uses the energy of water running or falling down from higher to lower elevations to generate mechanical energy, which is then converted into electric energy. Water from rivers has been used in Portugal to generate hydroelectricity for more than 100 years, though a significant hydroelectric potential remains unexplored, especially in small- and medium-sized hydropower plants. Kinetic energy of water was used centuries ago through mechanical work. In fact, the main components of watermills were developed more than 300 years before the Christian era. In Portugal, the use of water as a driving force has also been made for centuries, through the traditional watermills. As far as electricity generation is concerned, namely to feed small public lighting and industrial facilities, the use of water, through turbine-generator units, started in the last decade of the nineteenth century. The first Portuguese hydropower plant using what was then called the “white coal” came into operation on 31st March 1894. It diverted the water from the Corgo River, on Poço do Aguieirinho, near the city of Vila Real, and had the small installed capacity of 120 kW (161 Hp, as it was said back then). The effective electrification of the Country started in 1920, through regional systems and medium-sized hydropower plants (Lindoso, with 28 MW, being at the time the most relevant one). It then gained significant importance in the 1950s with the construction of the first large hydropower plants, of which some of the most relevant ones are Venda Nova, Castelo do Bode, Cabril, Picote and Miranda. The total installed capacity in large hydropower plants presently exceeds 6000 MW. The number of small hydropower plants (SHP), with installed capacities of 10 MW or less, grew considerably in the late 1980s, with the emergence of the newly created private power producers. The capacity presently installed in SHP is around 370 MW. Hydropower uses the flows and the elevation drops available in a certain river reach. The energy production potential is then directly related to the land orography, that creates the necessary heads, and to the available surface water resources, which, in turn, determine the flow volumes to be led to the turbine. As a result of the geographical variability of the hydropower production potential (that is dependent on the available flows and heads), small hydropower schemes are heterogeneously distributed through mainland Portugal, with 95% of the installed capacity being located from the Mondego river basin up North. It is also in the North of the Country that the greatest potential for the construction of new hydropower schemes may be found. Hydropower plants are mostly located on rivers, and they may be associated to dams with water storage capacity, generally of medium and large size, or to weirs without water storage capacity and harnessing the energy of seasonal river flows (run-of-river operation). Small hydropower plants may have different layouts that are meant to optimize, in each site, the relationship between divertible flow for the turbine operation and the available head. The Figure hereunder is a schematic layout of one of the most common small hydropower schemes located on rivers in the North of Portugal, in their upper reaches where the greatest elevation drops are found. These are commonly run-of-river schemes, as far as possible with partial regulation of inflows through small water storage capacity (pondage) in the hydraulic circuit for concentration of the energy produced during peak and full hours. They consist of small intake structures, free-surface and under pressure hydraulic diversions, powerhouses equipped with turbines, generally Francis or Pelton, and the necessary connection to the national electricity grid. Hydropower plants use well-developed technologies that enable safe, cheap and non-pollutant electricity generation, and represent an excellent alternative, both environmentally (non-emission of greenhouse gases), and economically (lower fossil fuel imports). resently, in an average year, around 30% of the electricity consumed in Portugal comes from hydropower, through schemes with different characteristics. Approximately 120 small hydropower schemes are currently operating in Portugal. These, together with ca. 15 power plants with installed capacities ranging from 10 MW to 30 MW, represent a total installed capacity exceeding 660 MW. 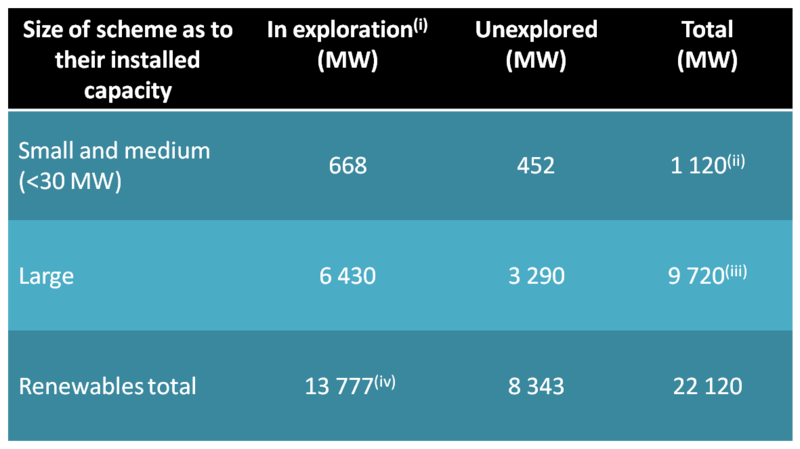 Based on a prospective assessment of the hydropower potential in Portugal, the Table shows the estimated existing potential, already explored or still to be explored, at the end of the year 2017.
it’s a renewable energy source, available in the Portuguese watercourses. it´s a clean energy source that does not produce greenhouse gases or other pollutant agents (ashes, radioactive material, other residues). it helps reducing the external energy dependence, through lower fossil fuel imports (oil, natural gas and coal). it helps to avoid, per each MWh of hydroelectric energy generated, the emission of 0.37 tonnes of greenhouse gases that would otherwise result from the use of fossil fuels. it helps Portugal fulfilling the commitments undertaken, and achieving the targets set at international level, namely in the Kyoto Protocol, in the Paris Agreement and in European Community legislation (Directive 2009/28/CE and the agreement established in July of 2018 for the objectives Energy Climate 2030). it complements other forms of electricity production, thus contributing to diversify and disseminate the means of production. 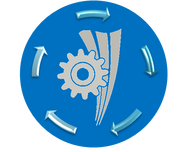 it promotes the creation of employment, both during the construction phase and during the operation and maintenance phase, and the creation of new infrastructures. it assures the stabilization of the energy fed into the electricity grid, enabling a quick response to peak demands and to substantial breaks in other forms of energy production (as shown in the following energy production/consumption diagram). 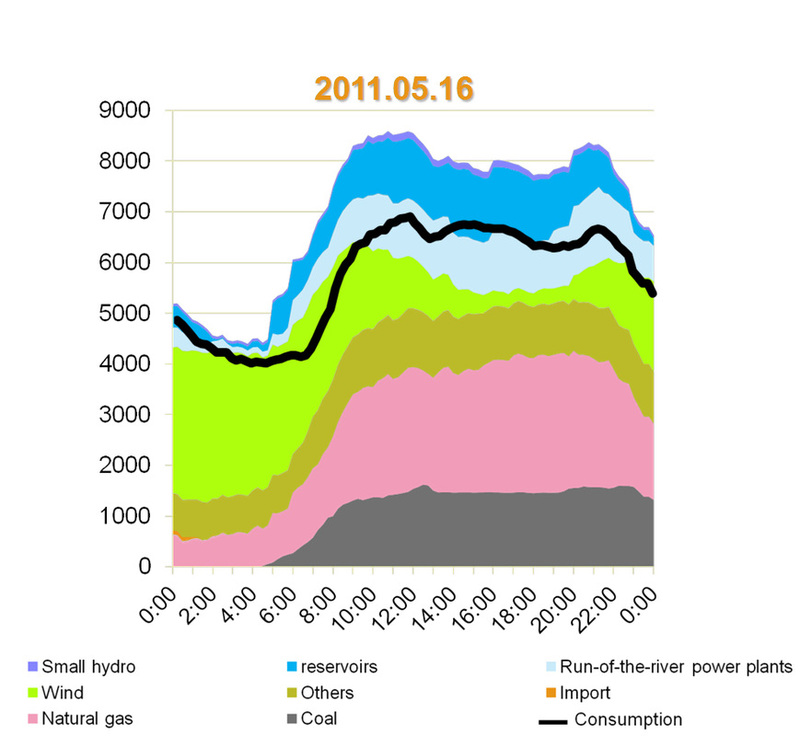 Daily energy production/consumption in mainland Portugal (where hours are shown in the x axis and power capacity, MW, is shown in the y axis) on 16th May 2011 (day in which the hydropower production was used to quickly respond to the demand, after a sharp break in the wind energy production).